Abbie and Jim have both appeared at the Circle of Friends Coffeehouse many times, but not together. You loved Abbie when she performed at the coffeehouse as a part of Red Molly. 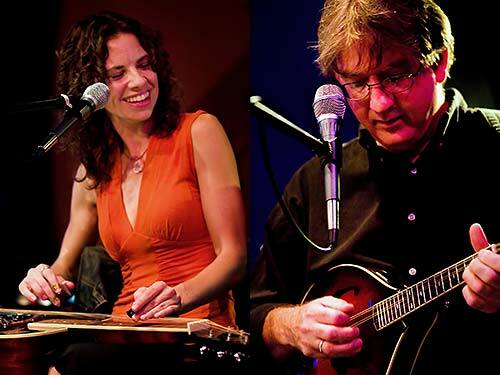 Jim has appeared with Tracy Grammer, Eliza Gilkyson, and his own band The Surly Temple. This will be a magical night and we hope you can join us. Abbie Gardner, the fiery Dobro player with an infectious smile has been touring with Americana darlings Red Molly for the past eleven years. After gracing stages from Denver to Denmark, from Australia to Austin, the band decided to take an indefinite hiatus in 2015, so Abbie is striking out on her own! No stranger to solo performing, she has three CDs to draw from, each with award-winning songs. Tales of love and loss, both gritty and sweet, ride the back of her by-now familiar, formidable slide guitar licks. She channels Lucinda and Bonnie, but remains pure Abbie. Jim Henry is an American folk singer/songwriter and world-class multi-instrumentalist. At center stage, whether as a solo artist or leading a band, Jim delivers his finely crafted original songs with a smooth, rich baritone voice and engaging story telling and humor. As a sideman, on a variety of electric or acoustic guitars, or on mandolin or dobro, Jim can render emotional sensitivity in one moment then tear into a rock or country solo with such fire it's hard to catch your breath. He is a master of adding whatever is needed at any musical moment. He has produced, recorded, played and traveled the world with Mary Chapin Carpenter, Paula Cole, Shawn Colvin, Alison Krauss, The Nitty Gritty Dirt Band, Los Lobos, Alseep at the Wheel, Gillian Welch and Dave Rawlings, The Weepies, Deb Talan, Eliza Gilkyson, Tracy Grammer, Susan Werner, The Boxcar Lilies...the list goes on and on.